ETP-MINI is superior to keyways or setscrews because it allows an adjustable, backlash free joint. Typical applications are mounting of hubs on small electrical motors, stepmotors and encoders. As no keyways are needed, the shaft will not be weakened and the unbalance will be lower, which is very important at high speeds, as the motor bearing is sensitive to vibrations. Also available in stainless, ETP-MINI R, suitable for the food processing industry etc. 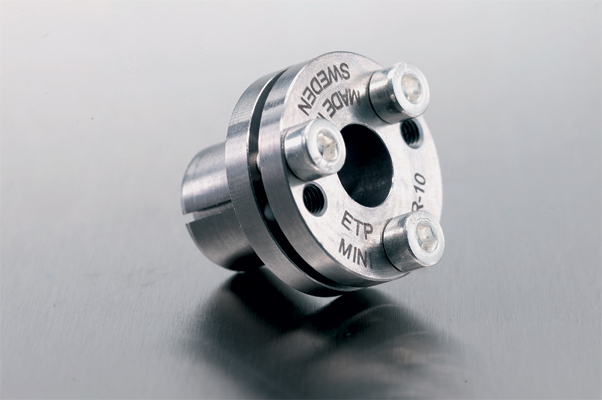 ETP-MINI consists of two, partly slotted, conical steel sleeves (type R stainless) and clamping screws (type R stainless). By tightening the screws the inner sleeve is pressed against the shaft and the outer sleeve against the hub thus forming a rigid joint. When dismantling, one or if necessary, two of the screws are moved to the threaded dismantling holes in the flange. By tightening, the sleeves will separate and the joint will loosen. ETP-MINI R has one screw more than the normal ETP-MINI in order to transmit the same torque (lower tightening torque for stainless screws). The built-in dimensions are the same. Available in stainless steel (type R). ETP-MINI R has stainless cap head screws but stainless hex head screws are available as accessories. 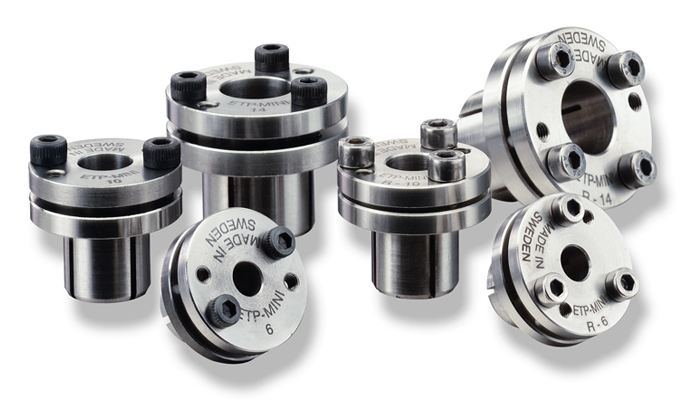 ETP-MINI, for small shaft sizes, is superior to keyways or setscrews because it allows an adjustable, backlash free joint. !